The violinist Midori is a visionary artist, activist and educator whose unique career has transcended traditional boundaries. Since her 1982 with the New York Philharmonic, she has concertized widely in the United States, Europe and Asia. She is also a noted global cultural ambassador and dedicated music educator. Midori has performed with most of the world’s great orchestras, such as the Berlin Philharmonic and the Vienna Philharmonic, sharing stages with legendary conductors, including Leonard Bernstein, Claudio Abbado and Mstislav Rostropovich. Midori’s dozens of CDs include a 2013 Grammy Award-winning recording of Hindemith’s Violin Concerto with Christoph Eschenbach conducting the NDR Symphony Orchestra. More recently, the two-CD set of her interpretation of J.S. Bach’s Sonatas and Partitas for Solo Violin was released to wide acclaim. 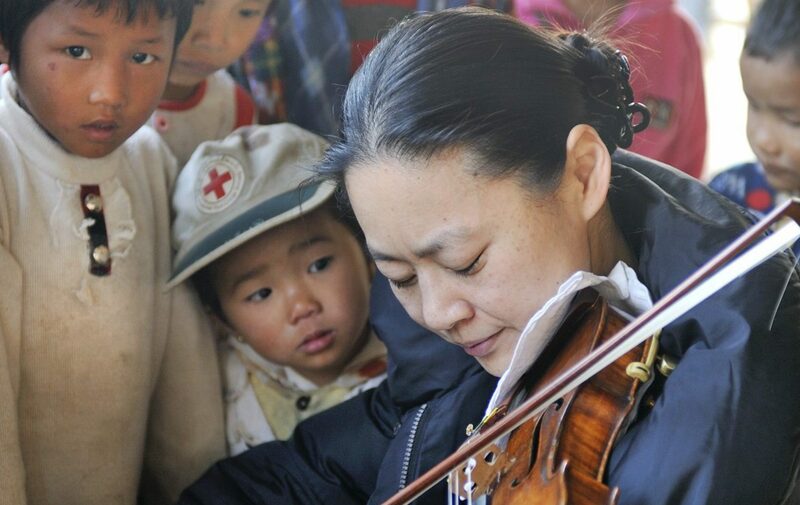 For more than 25 years, Midori has founded and led various non-profit organizations that provide music education and the musical experience to young people and underserved communities around the world, including in Asia, where the International Community Engagement Program brings musical presentations and cultural exchange to a different country every year. Midori was born in Osaka, Japan in 1971. She currently lives in Philadelphia, where she is a member of the violin faculty of the Curtis Institute of Music. Since 2007 she has served as a United Nations Messenger of Peace. A recipient of an honorary doctorate from Yale University, in 2012 she received the Crystal Award from the World Economic Forum in Davos, to go with her many other honors. Violinist Tatjana Roos has been making a name for herself since age seven, when she recorded Massenet’s “Meditation” as part of a museum show by the Turner Prize-winning artist, Gillian Wearing. A native of London, her first live performance was at age ten, as a soloist at Singapore’s world-famous Yong Siew Toh Conservatory. Tatjana studied at the Royal Academy of Music (Junior Department), and the prestigious Yehudi Menuhin School of Music. She since studied at other leading international institutions, including Austria’s Universität für Musik und darstellende Kunst, at Junior Guildhall, London, and at the New England Conservatory of Music, under the tutelage of Miriam Fried. Roos has been winning competitions around the world since 2010, when she received First Prize at Italy’s Andrea Postacchini International Violin Competition, also winning prizes at the Royal Tunbridge Wells International Music Festival (U.K.), Henri Marteau International Violin Competition (Germany) and as a semi-finalist at the 2018 Singapore International Violin Competition. Tatjana has participated in such major festivals as the Verbier Festival Academy (Switzerland), IMS Prussia Cove (UK), and at the Ravinia Steans Music Institute. She has recently performed concertos with the City Chamber Ensemble (UK) and the Odessa National Opera Theater Orchestra (Ukraine). She has studied and performed with such masters as Menahem Pressler, Kim Kashkashian, Ana Chumachenco, Pamela Frank, and Midori Goto. The violist Charlotte Malin is currently Principal Viola of the Hudson Valley Philharmonic. She is a 2017 recipient of a Master of Music degree from the New England Conservatory of Music, where she studied with the internationally respected Kim Kashkashian. She previously graduated from Northwestern University with a Bachelor of Music degree in violin performance, but later fell in love with the viola. A young professional, Charlotte has already performed with such leading American orchestras as the Hartford Symphony Orchestra, the Civic Orchestra of Chicago, and the New World Symphony in Miami. She has participated in concerts at the Newport Music Festival, the Peninsula Music Festival, with the Berkshire Chamber Players, with Fest’ Inventio in Paris, and has been a three-time Fellow at the world-renowned Tanglewood Music Center. She appeared as a soloist with the Northwestern Symphony and the Chamber Orchestra, was a member of the New England Conservatory’s Chamber Orchestra, and won a fellowship with the Far Cry chamber orchestra. Cellist Alan Toda-Ambaras performs around the world as both a soloist and a chamber musician. The recipient of both a Bachelor’s degree in History of Art and Architecture from Harvard University and a Master of Music degree from the prestigious New England Conservatory of Music, he was named the Most Promising Contestant of the 2005 Rostropovich International Cello Competition in Paris. Toda-Ambaras has performed with Yo-Yo Ma and other members of the innovative “world music” Silk Road Ensemble, along with other important groups such as the Borromeo Quartet and the Chamber Music Society of Lincoln Center. He has appeared as a soloist with the North Carolina Symphony, and has participated in the Taos Music Festival and New Hampshire’s Halcyon Festival. Alan Toda-Ambaras’s media appearances include performances on America’s National Public Radio, New York’s WKCR, Boston’s Neighborhood News Network, and also French television. Leading contemporary composers write their newest creations for him to premiere, such as Trevor Bača’s “Huitzil” for solo cello, and Stephanie Ann Boyd’s “Tekton” Cello Concerto. He is the co-founder of the wide-ranging Project LENS and co-founder, CEO, and cellist for the Eureka Ensemble, a new social action-oriented Boston music organization.